I hope you all had a fantastic Passover! Starting the second night of Passover, we began “counting the Omer”. 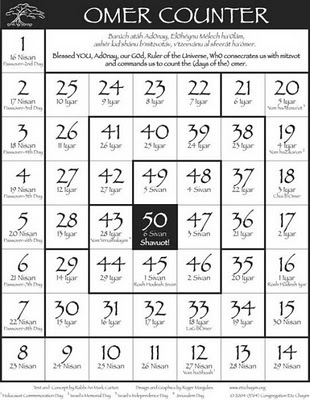 We count 7 weeks from Passover until we reach Shavous (also called Shavout), the time when the Jewish People received the Torah on Mt Sinai. There are several reasons for this counting. We are excited about getting the Torah, and every day we are reminded to grow spiritually in order to be ready to receive the Torah and follow its commands. This time is also a somber period, because Rabbi Akiva had 24,000 student die during this time, attributed to them not showing each other proper respect. In light of this, Jews keep 3 signs of mourning until the 33rd day of the Omer (no weddings are held, no listening to music with instruments, and no haircuts). We all try very hard to treat each other with love and respect during this period, and hopefully that extra sensitivity will stay with us and grow all year long. 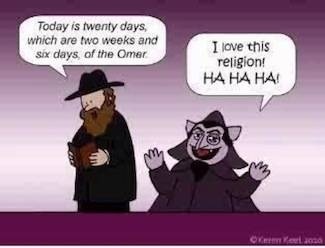 The 33rd day is known as Lag B’Omer, a fun day, and in Israel hundreds of thousands flock to the grave of renowned Kabbalist Rabbi Shimon Bar Yochai, who revealed the secrets of the Zohar. Bonfires are lit and there is singing and dancing to celebrate this Sage and the spiritual secrets he revealed. © Copyright 2014 Freejewishbooks.com | All rights reserved.